Spicy Mayo—Mix equal parts mayo and pepper jelly and use to spice up a ham, turkey, or veggie sandwich. Salmon Glaze—Mix together bourbon, honey, melted butter, and pepper jelly to taste. Spread over salmon and cook until done. Spiced-Up Vinaigrette—Add to taste to your favorite vinaigrette recipe (1 teaspoon to 1 tablespoon) or if your recipe calls for sugar or honey, replace it with pepper jelly. Spicy Grilled Cheese—Spread some red pepper jelly on the inside of one of your slices of bread and voila,..spicy grilled cheese! Mediterranean Turkey Burgers—Mix together ground turkey, melted butter, dried sage, and pepper jelly. Season with salt and pepper. Grill. Monte Cristo Sandwich—Usually this sandwich classic is served with jam on the side. Instead spice up your version with red pepper jelly. Do you have a special way you use pepper jelly? Tell us and share it in the comments below. 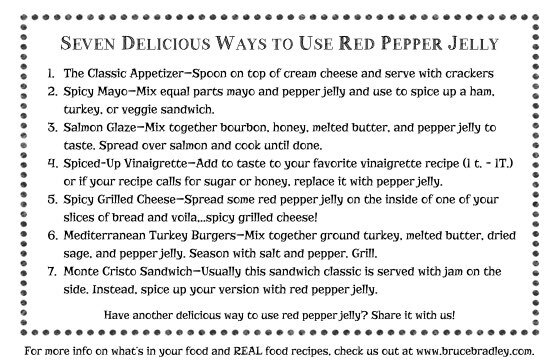 And if you want to include these recipe ideas with your homemade pepper jelly as a gift, just click here and print our recipe card! It’s that easy. My favorite way to eat pepper jelly is on a toasted bagel with cream cheese and pepper jelly. Yummmmm! I’ve never eaten pepper jelly like that before, but it sounds delicious!